Coined only sporadically from 1793 to 1857, half cents always seemed to be something of an afterthought at the United States Mint. 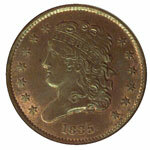 In the early years these pieces were typically struck only when the Mint was unable to provide the more popular cents. Since the planchets for both coins were usually furnished by Matthew Boulton's private mint in England, an interruption in the supply occasionally brought production to a halt. 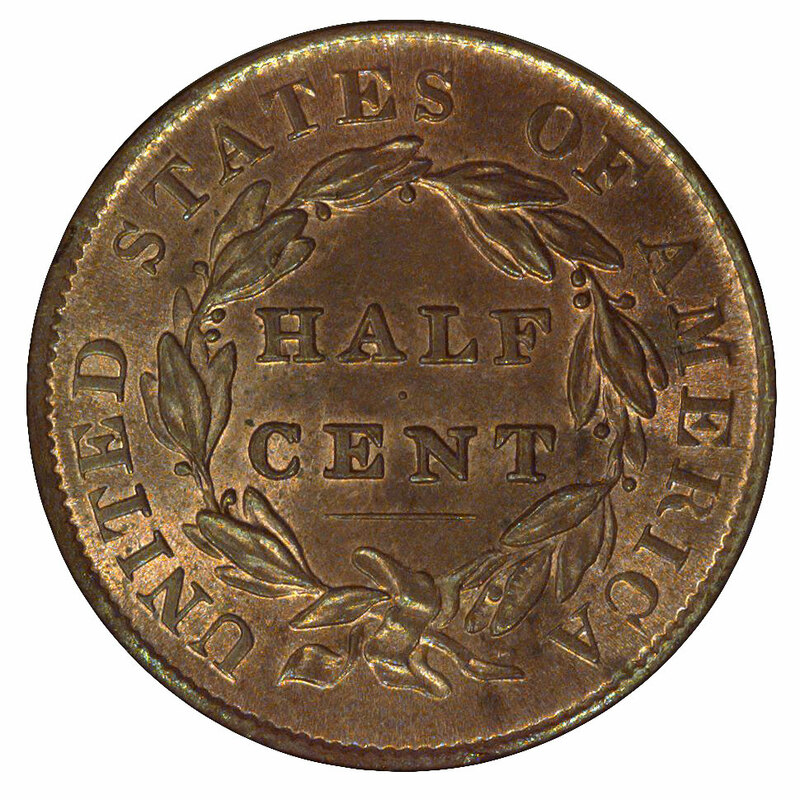 So little regarded were half cents that they were periodically minted from defective cent blanks or mis-struck cents which had been rolled out to the correct thickness for half cents and then cut to size. 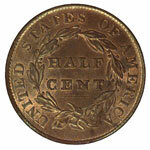 The hiring of John Reich as second engraver in 1807 led to the redesign of the cent the following year. The half cent, however, was considered so unimportant that it continued in production with the old design, becoming the only Draped Bust coin dated 1808. It wasn't until 1809 that Reich's Classic Head design was adapted for the humble half cent, and then production of these coins was suspended after just three years. Their minting resumed in 1825, only to be discontinued once again in 1836. This proved to be the final year for the Classic Head half cent, and a complete date series includes just thirteen pieces, two of them — 1831 and 1836 — great rarities. The quality of manufacture for these coins varied greatly over the course of the series. The early dates — 1809, 1810 and 1811 — typically are quite crude, while the issues from 1825 through 1829 are noticeably superior. Those dated 1831 through 1835 were coined within close collars and are almost always of excellent technical quality. The 1831 and 1836 issues are presumed to have been minted only as proofs, though worn examples of the former are known, and some specialists believe them to have been currency pieces. Assigning a grade to an undamaged, circulated example of the Classic Head half cent is fairly simple using published grading guides. 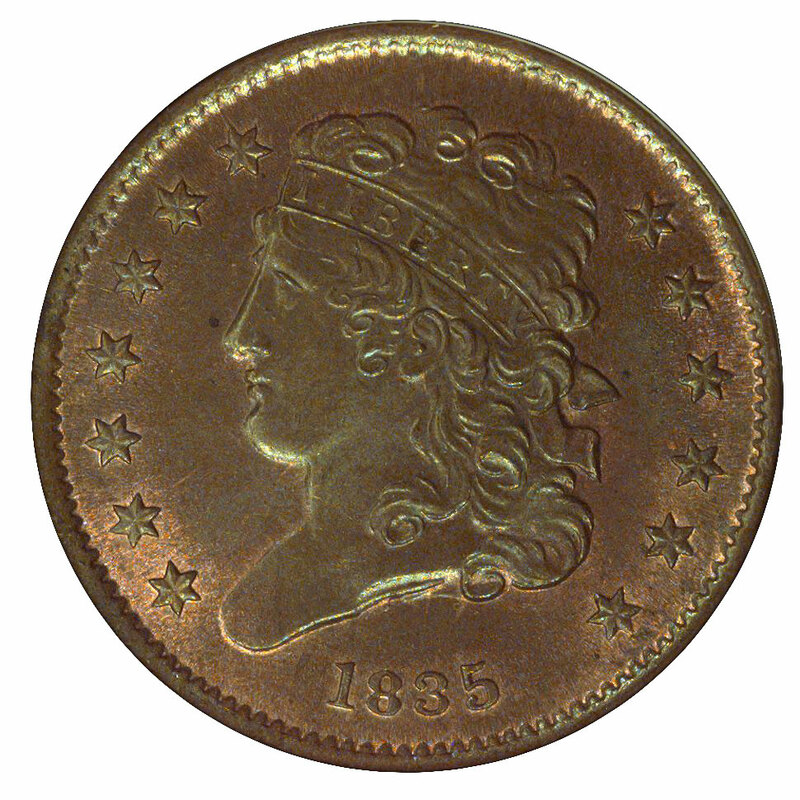 While some pieces are found not fully struck (the book The Official American Numismatic Association Grading Standards for United States Coins cautions that the 12-star variety of 1828 "normally shows weak spots on parts of the hair and leaves"), the biggest problem in grading coins of this type is found in their variable planchet quality. Circulated pieces, especially those from the first period of coining, may be slightly porous as made, and all dates in the series were subject to corrosion after entering circulation. These coins typically are rejected by major third-party grading services such as NGC. Some others offer "net" grading of such problem pieces, while NCS provides non-numeric details grading without utilizing a net figure. Mint State coins, particularly those issues from known hoards, such as 1828 Cohen-2, 1833 and 1835, are periodically available in mint red condition, but these are frequently found with numerous black spots from atmospheric corrosion. The dates 1828-29 and 1833-35 may be found with a blend of red and brown, but mint state examples of all other dates are rarely seen in any color other than brown. Also qualifying as "brown," at least as far as the third-party grading services are concerned, are those coins having multicolor or iridescent toning. One caution regarding both Mint State and About Uncirculated coins of this type is to watch out for pieces which have been improperly cleaned or "dipped" in a mild acid solution in a misguided attempt to restore their original red color. These typically are rejected for certification by grading services such as NGC, even when they've retoned to a somewhat natural appearance.